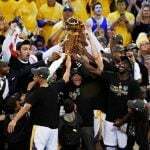 The Golden State Warriors are the heavy favorites in Las Vegas to win the NBA title, and challengers like the Cleveland Cavaliers and San Antonio Spurs aren’t doing much to entice bettors on taking their chances at an upset. 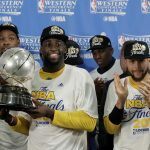 After winning 67 games during the regular season, the most in the NBA, the Warriors opened up in Las Vegas at about 1-2 favorites to win the championship in June. One game short last year to LeBron James’ Cleveland Cavaliers, bettors believe Golden State’s offseason acquisition of superstar Kevin Durant will give the team its second title in three years. Following the Warriors’ strong odds, the Westgate SuperBook lists the Cavs next at 7-2. The Spurs (9-1), Boston Celtics (20-1), and Houston Rockets and Los Angeles Clippers at 25-1. 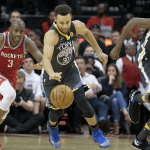 While the first round of the NBA Playoffs is typically a warm up for the best teams in the NBA, though no player or coach would ever admit so, the weekend’s first set of games provided plenty of storylines. Some, unfortunately, were tragic. 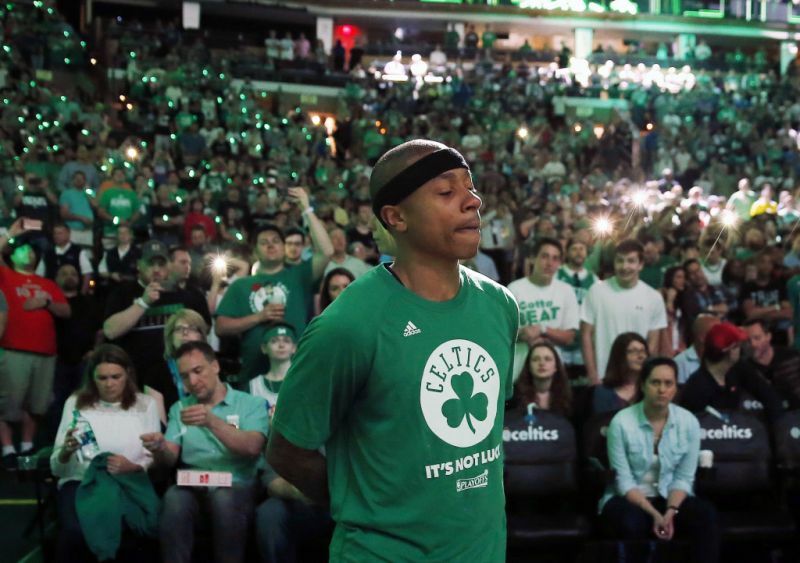 Boston Celtics guard Isaiah Thomas’ sister was killed in a single-vehicle car accident the day before his team’s Sunday matchup against the Chicago Bulls. Thomas opted to still play in the game, and despite his seemingly incomprehensible performance that included 33 points, five rebounds, and six assists, the Celtics lost 106-102. Thomas hasn’t spoken to the media, but his grief was on public display on Sunday. The SuperBook had the Celtics at -500 to win their series against the Bulls. That means a $500 wager would be needed to win just $100. But following Boston’s first-game loss, ESPN’s PickCenter gives the Celtics just a 51 percent chance of advancing. The defending champion Cavaliers, given -1000 odds of winning their series against the Indiana Pacers at the SuperBook, narrowly avoided a first game upset. Cleveland’s defense has been called into question, and it was clearly on display on Saturday. The Cavs shot 61 percent from the field in the first half and scored 66 points. However, they were only up seven at the half. CJ Miles had a chance to win the game for the Pacers, but his 14-foot jumped missed. The Warriors also didn’t get off to the start they wanted. Golden State was tied at the half with Portland 56-56. The Splash Brothers, Steph Curry and Klay Thompson, shot just 4-14 from the arc, but Kevin Durant responded with 32 points and snagged 10 rebounds. Golden State pulled away in the second half and ended up winning by a dozen. The Cavs and Warriors, according to Las Vegas, are headed for a rubber match in meeting in the Finals for the third consecutive year. Each team has one title, adding to the drama that’s expected to tipoff should Cleveland and the Warriors emerge in their respective conferences.